Our organization has garnered a remarkable position in this industry by Exporter, Manufacturer, Service Provider & Supplier of Double Toggle Grease Based Jaw Crusher in Udaipur, Rajasthan, India. It is precisely designed by utilizing superior grade material and hi-end technology. Furthermore, Our clients can acquire this product at easily affordable prices. Capacities may vary depending upon the type of rock gradation, breaking characteristics, compressive strength, rate and method of feeding, bulk density of feed, percentage of moisture in feed, method of operation etc. production capacity is affected by type of jaw plates(Plain / Teethed) and RPM of the machine. Casted through lifting on crushing stroke. ● Double Toggle provide maximum leverage to the long stroke eccentric. ● Wide entry throat ensures easy feeding to the crushing chamber. ● Strong steel structure and other parts are made from certified quality material only. S.NO. 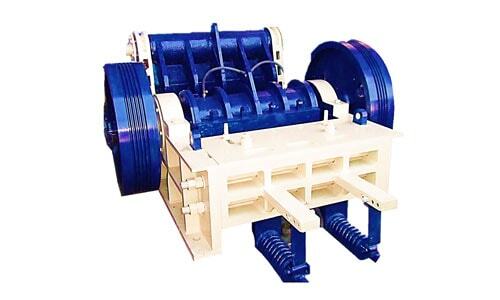 JAW CRUSHER SIZE RECOMMENDED CAPACITY IN TONS / HOUR WITH JAW CLOSED SIDE SETTING RPM DRIVE HP APPROX TOTAL W.T. 0.25" 1" 1.25" 1.50" 2.00" 2.50" 3.00" 3.50" 4" 5" 6" 7" 8" 9" 10" 11"
Double Toggle Grease Type Crusher lubricated Jaw Crusher gives longer life of its jaw plates in comparison to other crusher because this of crusher works on the principle of crushing without rubbing.